While the gubernatorial contest between former Democratic National Committee Chairman Terry McAuliffe (D) and state Attorney General Ken Cuccinelli (R) remains a toss-up for now, the battle for control of the House of Delegates is decidedly not: Republicans will retain control of the Virginia House. To regain a majority in the chamber, Democrats must make a net gain of 19 seats in 2013. As the analysis below shows, this is a task that can be described as virtually impossible. As long as the gubernatorial contest at the top of the ticket remains close, the GOP may suffer, at most, a net loss of about five seats in November. However, even if McAuliffe wins the governorship, Republicans won’t lose much more than that, and possibly fewer seats. If Cuccinelli surges to victory, his party will come close to maintaining its current majority and might even net one seat. Despite Virginia’s recent history as one of the most competitive states at the federal level, the lower chamber of the state’s General Assembly has been anything but competitive in recent times. Since wresting control of the 100-member House of Delegates from Democrats in 1999, Republicans have consolidated their majority, particularly after the latest round of redistricting. Going into November, Republicans hold 66 seats to the Democrats’ 32, with one independent (who caucuses with the GOP and is retiring) and one vacant seat (a safe Republican seat). Why the lack of competitiveness in Virginia? It stems from a number of factors. Most importantly, the electorate in Virginia’s off-year state elections looks very different from the state’s electorate in presidential elections. In 2008 and 2012, more than 70% of registered Virginia voters turned out to vote for president. But in the competitive 2005 gubernatorial election, turnout was only about 45%, a number that slid to just over 40% in the 2009 race. In off-year elections, those who are more likely to vote have a stronger influence on the results. The off-year electorate is wealthier and older, and therefore tends to be whiter and more conservative. 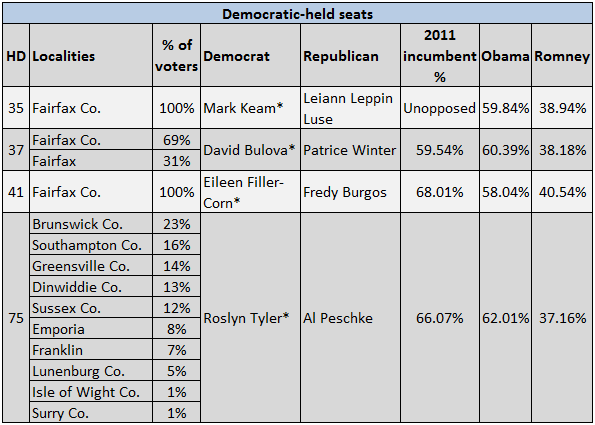 This partly explains how Republicans can control 16 Virginia House districts that President Obama won in 2012. Like their national colleagues, Virginia Democrats dread voter drop-off in non-presidential years. Additionally, while Virginia may be a purple state, its political distribution is not geographically equal. Most Democratic votes are clustered around Northern Virginia, Greater Richmond and Hampton Roads. Much like Democrats in the federal U.S. House of Representatives, Virginia Democrats suffer from being inefficiently distributed across the state, especially minority voters who are heavily concentrated in central cities. Correspondingly, most of the races discussed below are found in the state’s Urban Crescent (the three major urban areas concentrated in the eastern part of the state). As is often the case, redistricting has also played a major role in the House’s lack of competitiveness. The party that controls the redistricting process is always going to help itself, regardless of the party. In Virginia, Republicans were positioned to create an even friendlier House map after the 2010 Census, while their Democratic counterparts in the Virginia Senate drew their own gerrymander (though it failed to preserve the Democratic majority in the 2011 Senate election). Thus, even though the 2009 election was an ugly affair for down-ticket Democrats because of state Sen. Creigh Deeds’ (D) overwhelming loss to now-Gov. Bob McDonnell (R), the 2011 election in the House actually turned out to be even worse for the minority party. Lastly, Republicans’ overwhelming control in the Virginia House is not only a product of voter distribution, voter turnout and redistricting. It’s also a result of Republicans running stronger candidates in many cases. Even with the huge voter drop-off in off-year elections, it would still be hard for Republicans to control some of these districts where Obama won unless the GOP candidates fit their constituencies to a decent degree. Perhaps the best example is Del. Tom Rust (R, HD-86), a moderate who is so entrenched that he didn’t even have an opponent in 2011 despite representing a district where Obama won over 60% in 2012. Based on conversations with both parties, it seems there are 19 races that can credibly be considered in play this fall, though it’s highly unlikely that even a majority of these seats will switch hands. Of those 19 contests, 15 are Republican-held, while four are controlled by Democrats. This means that even if Democrats somehow managed to sweep all of these races, they’d still be four short of a majority. 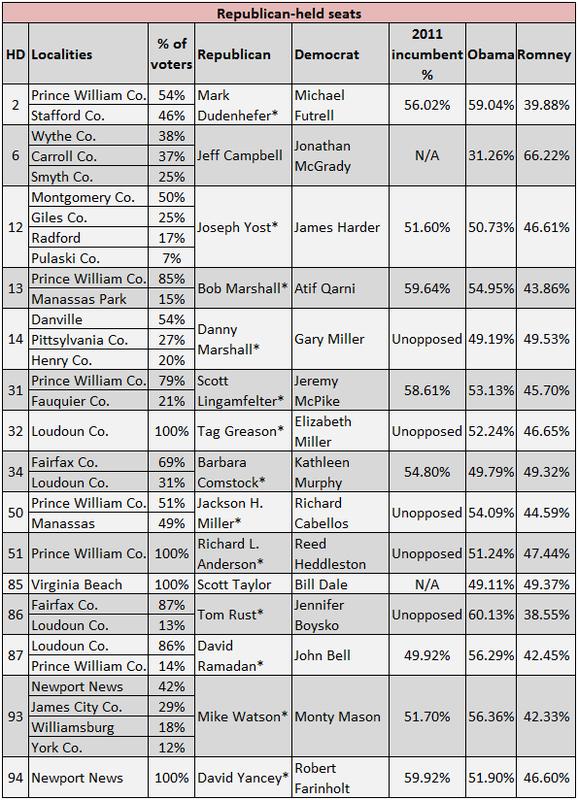 This count also doesn’t include HD-4, where incumbent Del. Joe Johnson (D) is retiring after more than two decades of service. This ancestrally Democratic district supported Mitt Romney at a 68% clip in 2012; now Democrats have failed to nominate a candidate for their own open seat. Therefore, Republicans have already banked a takeover in November, meaning that Democrats actually need to win 20 seats, not 19, to achieve a majority — something akin to climbing Mount Everest in a blizzard. Data on the 19 potentially competitive districts is displayed below in Charts 1 and 2. Notes: *Indicates incumbent seeking reelection. Any locality not listed with “Co.” is an independent city. Sources: The Virginia Public Access Project for district geographical voter data; Virginia State Board of Elections for 2011 election results; Daily Kos Elections for presidential vote by House of Delegates district. Despite the party’s unenviable position in the General Assembly’s lower chamber, national Democrats are taking some notice of these down-ticket races. Howard Dean’s PAC, Democracy for America, has endorsed Democratic candidates in 11 races, presumably with the intention of eventually spending money on their behalf. Of those 11, seven are among the races we view as potentially competitive this cycle, including the three most competitive seats, held by Dels. David Ramadan (R, HD-87), Mike Watson (R, HD-93) and Joseph Yost (R, HD-12). Of those three, it looks as if Ramadan’s seat will be the most heavily contested House district in the state. Ramadan won by only 51 votes in 2011, making him a natural target for Democrats. As for the other first-tier districts, Watson’s is the most Democratic of the trio, and he narrowly ousted an incumbent in 2011. Unlike most of the competitive seats in 2013, Yost’s district is far from Northern Virginia or Hampton Roads. Situated in and around Blacksburg, VA (home of our host university’s rival, Virginia Tech), HD-12 was long held by Democrats until Yost’s victory in 2011. But Yost is unusual in that he’s a Republican who has won accolades from the traditionally Democratic Virginia Education Association — he was the organization’s 2013 “Legislative Champion of the Year” — which may give him some cross-party support. But for Democrats, many of their targets may prove elusive. For many years, Democrats have sought to unseat controversial Del. Bob Marshall (R, HD-13), but even though Marshall occupies a 55% Obama district, his strong political organization and support from the GOP base have routinely allowed him to win comfortably. Marshall could challenge Sen. Mark Warner (D-VA) next year, although he’d be a heavy underdog in November if he got the nomination (which will be decided at a convention). Del. Barbara Comstock (R, HD-34) is another incumbent often vilified by the left, but her spectacular fundraising abilities will once again make her difficult to beat in 2013. (Comstock may eventually seek Rep. Frank Wolf’s (R) seat in the U.S. House of Representatives whenever Wolf decides to retire.) The aforementioned Tom Rust, sitting in the most Democratic seat held by a Republican, is also a seemingly vulnerable Republican who may be just out of reach for Democrats. Rust has a bipartisan image, even getting a shout-out from McAuliffe in the most recent gubernatorial debate. Despite winning a contested first race in 2009, Del. Tag Greason (R, HD-32) drew no opposition in 2011, and his 2013 opponent is not seen as top-tier. Veteran Del. Scott Lingamfelter (R, HD-31) has routinely beat back challengers despite being viewed as potentially beatable. Two incumbents in districts with significant minority populations, Dels. Mark Dudenhefer (R, HD-2) and Jackson Miller (R, HD-50), have attracted minority opposition candidates, but those districts are among the most vulnerable to voter drop-off from presidential to off-year elections, which harms Democratic chances. A couple of Republican-held open seats are also worth mentioning. In Virginia Beach, HD-85 featured a spirited GOP primary that saw the establishment choice lose out on the party’s nomination, a development that may boost the chances of Bill Dale (D). And in what may be an attempt at misdirection, Democrats are also seriously challenging for HD-6, an open seat in southwestern Virginia where Romney won 66% of the vote in 2012. But Democrats claim that their candidate, Jonathan McGrady, may have exactly the profile to make the race interesting. We’ll see. For the GOP, its list of legitimate targets is slim besides the automatic pick-up in HD-4. But the party of Lincoln will actually have Republicans to back in races against Dels. Eileen Filler-Corn (D, HD-41) and Mark Keam (D, HD-35), which should at least make those contests competitive. In 2011, Filler-Corn faced only a Libertarian candidate, while Keam was unopposed. Republicans will also seek to upset Del. David Bulova (D, HD-37), having recruited a former city council member from the City of Fairfax, Patrice Winter, to run against the incumbent. While unlikely, it’s conceivable that Del. Roslyn Tyler (D, HD-75) might have some trouble in 2013, despite her district’s majority-minority status. Then again, she soundly beat her 2013 opponent last time around. All in all, there are many trees to look at in 2013, but the forest tells the story of the Virginia House of Delegates: Republicans will rule the roost in the House for the next two years. By how much will depend on a number of factors, particularly how the campaign unfolds at the top of the ticket. Should the gubernatorial race remain tight, Democrats will be positioned to possibly pick up a few seats simply because Republicans are a bit over-extended. This may happen even if Cuccinelli wins the governorship. On the flip-side, if McAuliffe grabs the Governor’s Mansion on Nov. 5, Democrats could conceivably pick up a few seats that presently seem out of reach. So the likeliest range of possible outcomes this November stretches from a net gain of one for Republicans to a net gain of five for Democrats.